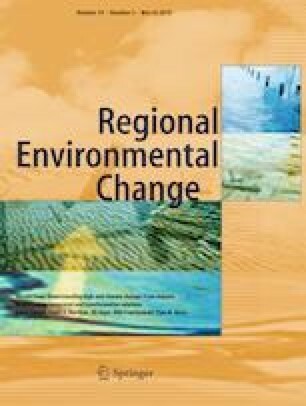 This study assesses the current mode of forest use and management at rural community level in South Africa with a view to locating space for forest-based green growth initiatives development and factors that might shape the uptake of such initiatives. This was done with respect to the need to decouple rural livelihood activities from forest degradation. Vegetation type was used as a criterion to select three municipalities (Makhado, Mutale, and Thulamela) in Vhembe District. Seven rural communities in each municipality were selected giving a total of 21 rural communities. Using stratified proportionate random sampling procedure, a total of 366 households were selected and interviewed. Findings showed that the informal forest sector is best positioned for immediate delivery of green growth benefits to the local communities. Firewood and wild edible insect (mopane worms) were identified as the priority products for forest green growth initiative uptake. However, issues relating to skill and technical capacity were identified as a barrier to the uptake of green growth initiatives in the communities. The study thus recommends capacity enhancement initiatives and forest establishment programmes such as afforestation and reforestation as a means of facilitating forest green growth uptake and delivery of green growth benefits to the study communities. Region of Focus: The article’s specific region of focus is Southern Africa. However, the results and implications are relevant to the whole sub-Saharan Africa due to similar patterns of dependence on forest resources for livelihood by the rural populations. Thanks to the community members and leadership in sampled communities in Mutale, Makhado and Thulamela. The valuable inputs made by Andries Masange, Frans Kanfer and Orlean Mfune are gratefully acknowledged. Opinions expressed and conclusions arrived at are those of the authors and are not necessarily to be attributed to either of the sponsors. The first author is grateful to UNU-INRA for the opportunity to be part of the PhD Visiting Scholars Programme. He also acknowledges the National Research Foundation, South Africa, and the South Africa Forestry Company Limited (SAFCOL) through the Postgraduate Forestry Programme, University of Pretoria, for sponsorship provided for his doctoral study which enabled him to undertake the field work component of this study.